CloudCal is the only calendar-organizer that unites all your calendars in one place. In this program, you can see all the events from your social networks and other applications. This is the ideal application for planning and organizing a schedule for a day, a week or a month. The calendar clearly shows the degree of employment for each day. The user is always aware of when his schedule is overloaded and on what days he should better plan new things. 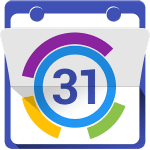 This calendar for your Android device gives you the ability to schedule time and upcoming deals, also you will have the ability to synchronize your data with Google and Outlook. An interesting feature of this calendar is the ability to make the application’s interface in the form of a dial. If you specify the desired settings, then the application will be able to work on other devices. It is possible to set reminders of an important event. And control by gestures and the presence of several types of calendar put this application out of the competition. Also, using a gesture, you can send out an invitation to meet, attach a document to a file, etc. Customize the background and the theme of the calendar to your taste, each event can be marked in different colors. You can manage the task list, customize the execution time. Buyers of the paid version can synchronize with CloudCal events from Trello, Outlook, Evernote and other services, and also attach snapshots and other attachments to the dates. Sync with all device calendars.